The THIRD book in the VIRTUAL ARCANA series. The series starts with book 0: The Fool. As Kelsey delves deeper into the illegal world of virtual reality, her understanding of the Arcana expands and her feelings for Xander evolve. When Xander's tarot cards fail to give her clarity, Kelsey's training commences. But mystical meetings and storybook scenarios provide her with answers that only trigger more questions. 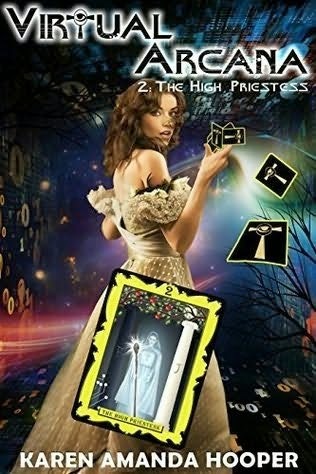 The High Priestess was another wonderful installment in the continuing story of Virtual Arcana. Kelsey end's up with more questions then answers and we finally get to start learning a little more about Arcana, the government, and the world outside. I loved all of the different Virtual landscapes that we were treated to in this installment. Seeing the High Priestess's card reading was really interesting giving us a further glimpse into what Kelsey is really thinking about all of this. I also really enjoyed getting to see Kelsey explore her feelings for Xander a little more, and seeing his reactions to her was great. I really like them together and I can't wait to see their relationship develop further. I loved the new characters that were introduced in this book as well and I can't wait to see more of each of them as the story continues. And the Arcana! I was so excited to start learning more about the cards, virtual reality, and what they all have to do with the government. With all the questions and answers in this story The High Priestess is definitely an installment that you don't want to miss! Note: I reccieved an electronic copy of this book from the author in exchange for my fair and honest opinion which I have stated above.